Another purchase for local travels & trips has been the Tardis, our VW T5 Campervan. While our T5 has a good spot for one Brompton in the rear compartment under the bed, a rear bike carrier is necessary for whichever of our bikes go with us on multi-day trips. Mungo & Daisy fit well with the Tardis trips; all-purpose bikes with mudguards, side-stands & nice rides but with the added benefit of foldability for storage when we don’t want to lock them (unfolded) on the bike rack. Warning: some paragraphs follow that involve mathematics. Perhaps you may have a need to scroll/swipe to the last paragraph & pic? What an all-purpose bike also needs, is a range of gears that will suit most terrains that our trips take us to. Rather than just test riding a bike up every hill you can find, to see if the gear ratios are suitable, a means of comparing gear ratios is to obtain/calculate the “Gear Inches” (GI) by multiplying the gear ratios for bottom & top gears by the diameter of the wheel. For some people this may be somewhat difficult but for me I’ve already dug out the hub gear info (eg via Hub Gear Calculators on the Internet), I can count the teeth on the rear cogs & chainrings, & I can measure the wheel diameter. Actually, this last item is usually very difficult if you’re resorting to a tape measure so the best way is to calculate the diameter from the ETRTO size on the tyre. The ETRTO size for a Brompton Kojak is 32-349 & the formula for calculating wheel diameter in inches is (2×32+349)/25.4 (ie 413/25.4 = 16.25). An additional tip if you want to set your bike computer wheel size, is that the wheel diameter of 413mm can be multiplied by Pi to give the wheel rollout distance of 1297mm. How’s that? & all without needing a tape measure! Before I eventually resume my tale about Mungo, let’s compare some GIs. A typical road/race bike that uses 53 & 39 teeth chain rings & an 11-25 teeth cassette has a GI of 41-126. A mountain bike could be about 17-105, while Robinson, my 6-speed “reduced gearing” Brompton is 29-88 & a 3-speed Brompton would be about 44-79, depending on options. As you may see, nothing beats an MTB on being able to climb hills – just as long as you can keep the front wheel on the ground? Also, if you want to go fast on your Brompton on the flat then you’ll have to pedal like crazy to be ahead of the race bike. The beauty of Mungo is the feel of riding a road/race bike with similar gear shifters & fairly light weight, as well as a GI of 28-123. This comes from the small wheel size, a 53 teeth chain ring, an 11-26 teeth cassette & 9-speed rear derailleur but also with a 3-speed SRAM dual-drive rear hub (similar to the 6-speed Brompton with a 2-speed derailleur setup & a 3-speed hub?). A scan of the above GI figures should show that Mungo is ably suited to getting up hills, as well as being pedaled fast. Unfortunately for me, my heart-related limited blood/oxygen capacity (refer earlier blog post Hill performance for info) still puts Mungo (& me) at a disadvantage when I compare it to Ralph’s low speed gear climbing ratio. Having resolved Mungo’s original tendency to drop the chain when in top gear (by fitting a fixed front derailleur to contain the chain onto the front chainring) & considering that Mungo’s missed out on any overseas trips, it seemed a shame that Ralph could be preferred for climbing hills reached while on Tardis trips? No, Mungo wasn’t going to lie down & its standard crankset size suggested to me that a 39 teeth chainring from my box of bike bits was going to be a good swap with the usual 53 teeth item? So, here’s a pic of Mungo now equipped with the smaller front chainring (which provides a GI of 21-90, seems to escape the MTB tendency to wave the front wheel on steep hills & still gives a top gear “adequate” for my current capabilities?). Mungo rides again?! 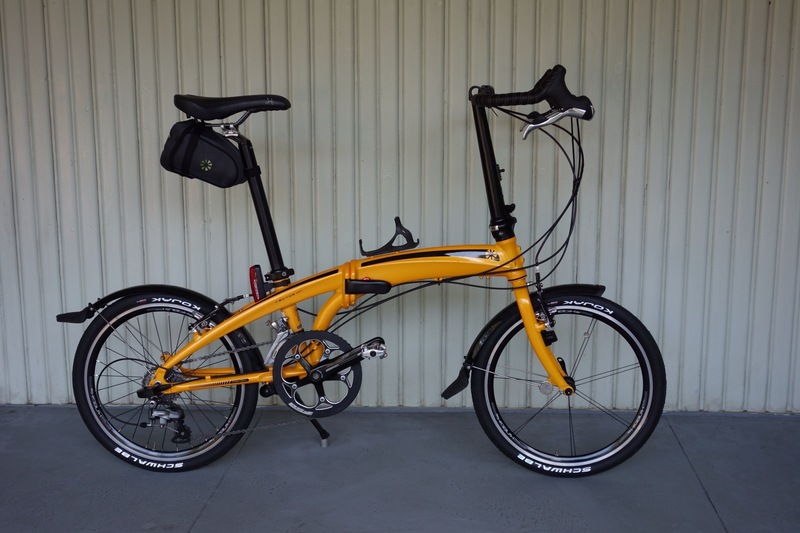 My 20″ Dahon Vector X27h preceded my Bromptons & was an easy choice for a folder when most of my bike-time was spent on a carbon frame race bike. It has a great road-bike feel & the specs make it one of the best performance folders you could ever want (well, until it’s superseded via the usual later-model upgrade-cycle?). Funny about the 20″ moniker though; the wheel size is 18″ on all the Dahons (& Terns) that I’ve seen. 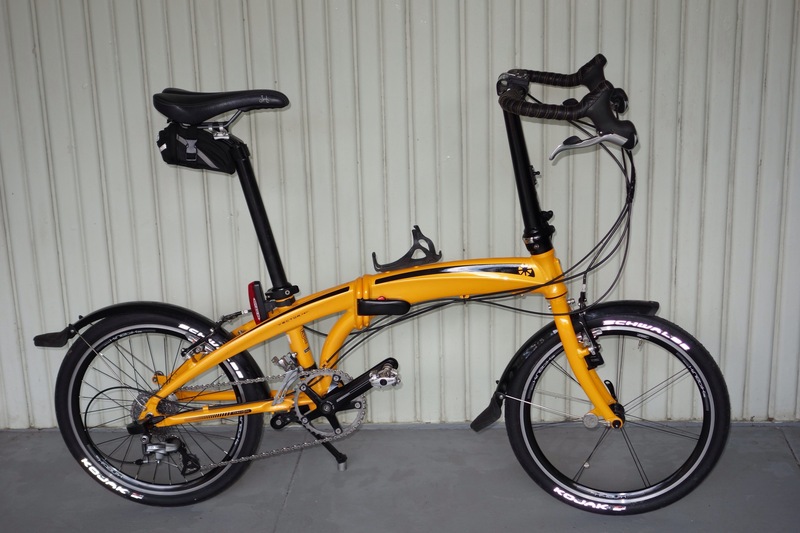 To say, “what lets it down…” may give the wrong impression; it’s a great bike – it’s just that Bromptons are so good & show it up in the fold & engineering departments. However, being a performance bike it probably lacks some of the versatility that a good folder needs. My Vector has also had a number of upgrades (sometimes just to “correct” the engineering?) & our lives together have been a learning experience (often frustrating but better for the learning?). The one aspect of the spec that is pretty unique is also the item that is (almost) the “Achilles Heel” – the 27-speed transmission, with 3-speed hub gears & 9-speed rear derailleur. Once sorted & aware of the quirks; no problems? Swapped to Kojak tyres – great ride on Sydney roads after the rock-like Durano tyres?